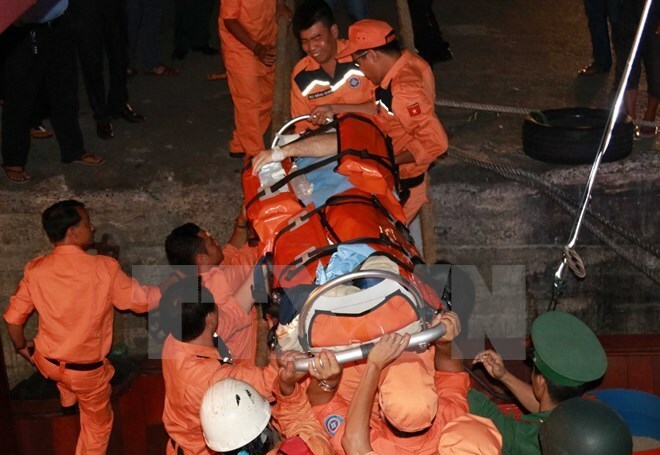 Khanh Hoa (VNA) – A 62 year-old sailor who went into coma while working on Panamanian ship Oriental Jade received timely treatment in the central coastal city of Nha Trang after he was taken ashore by the Vietnam Maritime Search and Rescue Coordination Centre (Vietnam MRCC) on August 9. F.Zeletic developed high blood pressure and blood vomit and lost consciousness when ship Oriental Jade was 141 nautical miles southeast of Nha Trang city’s shore. It was en the route to the Republic of Korea. Receiving healthcare support request from the Captain of ship Oriental Jade, the Vietnam MRCC gave first aid advice before dispatching its rescue vessel to bring the man ashore. The same day, Nguyen Van Vuong, a 27 years-old man from the central province of Nghe An, was also saved by the Vietnam MRCC after becoming unconscious while working on Palau’s ship Lucky Star 8. Snapped by a crane cable from 10 metres height, Vuong suffered a severe trauma in his head and a stress shoulder fracture and he was then knocked unconscious.